A Monster Calls is a fantasy drama film and an adaptation of the award-winning 2011 novel of the same name. Directed by Juan Antonio Bayona (The Orphanage, The Impossible), the film's crew is joined by the novel's author, Patrick Ness, as the writer. 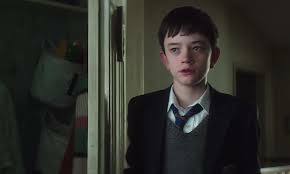 Centred around 12-year old Conor O'Malley, (Lewis MacDougall), A Monster Calls focuses on a dark time the bullied young boy is going through. His mother; played by Felicity Jones (the hot lady in Star Wars: Rogue One), is terminally ill which has resulted in Conor being in independent turmoil, feeling more trapped and just plain alone. That's when he begins to encounter the Liam Neeson-voiced humanoid tree man know as the "Monster", who begins to tell Connor mysterious tales in order to aid the dire state his life is in. 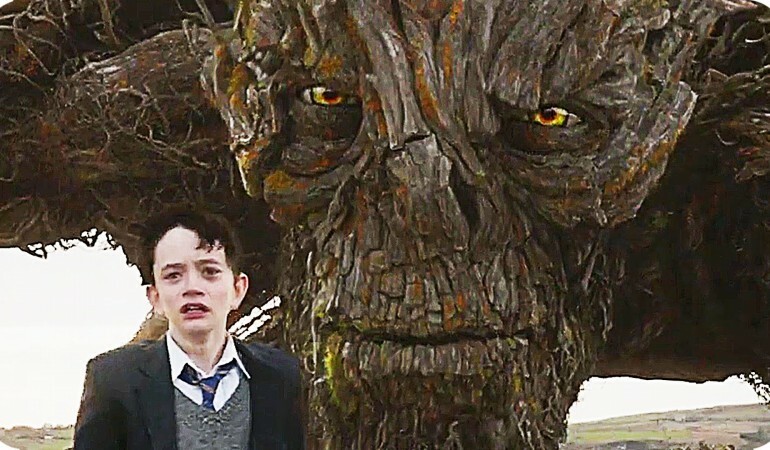 Whether you've read the book before, a fan of well-made fantasy films or just love a good, clever story, A Monster Calls whisks you up and takes you on a deep, beautiful and emotional ride that you'll be holding in your heart for years to come. 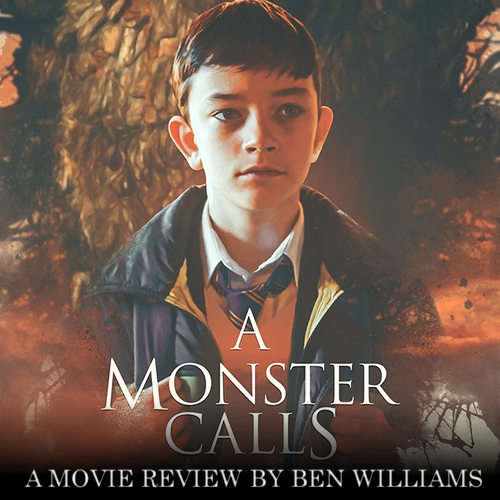 Going into the cinema with no knowledge of the novel along with two friends who read it from cover to cover, I found that both types of people who go to see A Monster Calls will be pleasantly surprised on different fronts. As someone who only knew the plot of the film as "sad boy makes friends with Liam Neeson tree man" I was surprised to find that the film throws newcomers to the story into an unexpectedly compelling narrative. Lovers of the novel will find themselves thrilled as well as they witness the story come to life in this fully faithful adaptation, given one or two minor details. If you look at a poster and vague summary to see what a 12A fantasy film like this is about you will probably expect the standard tropes that have been followed for years: "sad child; magical element gets added, their relationship develops, odds are overcome, magical element fixes everything, boy and family are happy, the end". If anything, that's what I was expecting but my god, this film is clever. Conor's only real connection with another person in his life is his mother. His father lives in America and he doesn't get along at all with his grandmother. His mother has been the only real pillar of joy in his life and now he is slowly on the verge of being taken away. It's a story representing the real world fact that not everything goes the way you want it to. It's a story taking you through a journey; like so many people have gone through before, of loss, and the struggles a person can go through trying to deny it despite how inevitable it is, before finally coming to accept that they need to let go. The way the CGI Monster blends in leaves you in awe. 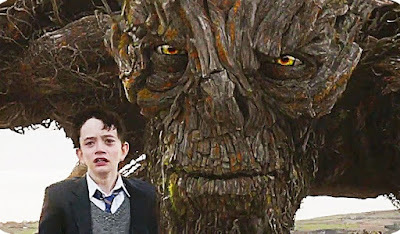 Unquestionably, one of the biggest highlights to A Monster Calls is the Monster. That's not because of the Liam Neeson's great performance, although that certainly didn't hurt it at all. It's the wondrous elements the character and what his dialogue brings to this realistic, bleak and dreary world. 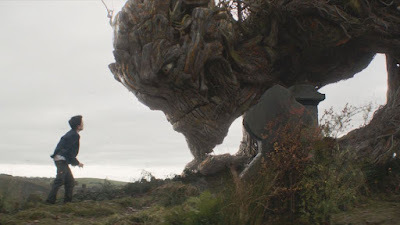 Not only does the CGI Humanoid Tree look detailed and enriched with life enough to not look ill-fitting compared to the environment around him, but he enriches it. The stories he tells are in the form of eloquent water colour paint animations, each one vaguely relating to Connor's situation. These are what will probably be audience members' favourite parts of the film. The animations for these tales in their water colour form are meaningful paintings come to life. They are eloquently lifelike and expressive. Liam Neeson delivers the best kind of, wooden, performance. HA. There is a key point to all of the stories: realistic morals. Learning more about the characters through each of The Monster's Tales, Conor comes to conclusions about who the "villains" and "heroes" are before basically being told "actually, no. This person's kind of an arse sometimes". The tales are dragged down to reality and make the point that not all stories class what's good and evil in black and white like Conor and many in the world seem to think. It's not exactly a ground breaking point but it's very rare for a Fantasy film to explore the excellent point that all people in their own way are very complicated. A person can be goodhearted and beloved but it doesn't mean they haven't done anything questionable or immoral along the way. You feel like Liam Neeson-Tree Man is giving you a life lesson all the whilst serving you a fascinating narrative that develops Conor's character. 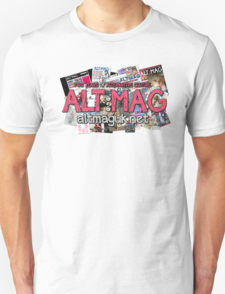 It's a breath of fresh air to put into a film of this type of premise and setting. Massive amounts of respect need to be given to the live-action cast as well. A child actor being the lead is usually met with initial hesitation, especially one with dramatic elements but Lewis MacDougall as Conor is fantastic. Even when Conor isn't saying anything during the most sensitive scenes, between him and his mother for example, you can read the revelation of emotions seeping onto his face. MacDougall appears to actually encapsulate on his face Conor's feelings of sorrow, anger and pain before he tries to bury them behind that stone wall the character puts up. There are scenes like a major one involving a school bully, where Conor deals with things not going the way he wants them to by letting go of his feelings in bursts of hurt and rage, which continue to lay out a bright future for the 14 year-old MacDougall. Whilst Felicity Jones delivers a strong performance as the frail yet headstrong mother, Lizzie O'Malley, Tobey Kebbel (some will know from Black Mirror) serves well as father: being the addition of humour and light heartedness that is a welcome addition to A Monster Calls' structure. 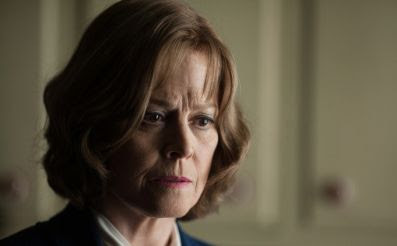 Conor's Grandmother, played by Sigourney Weaver (Alien franchise, Avatar, The Cabin In The Woods, Finding Dory), is another favourite because her relationship with Conor is a major connection to the film's main message. Weaver's American accent does sometimes break through, taking you out of the scene sometimes but her most dread-filled scenes will probably leave a tear trickling down your eye, like many other moments. Juan Antonio Bayona has been able to capture what made Ness' novel so great and craft it into a visual, character and narrative-driven marvel. 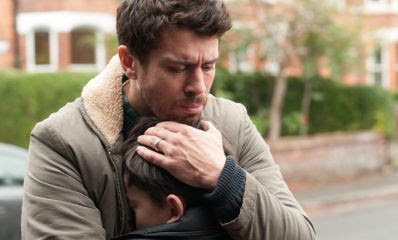 A Monster Calls is a unique page in the Fantasy Drama genre for delivering an engaging story about accepting loss and being honest with yourself. It utilises its Fantasy element to lead that story toward a genuine message applicable to people of all ages. It's not a film you'll want to watch if you're looking for something to perk you up after a bad day but it's something fans of great storytelling can always go back to when they're looking to have their heartstrings tugged. I feel like A Monster Calls may be seen as a memorable classic in its genre in years to come, especially whenever you need the voice of Liam Neeson to lay down some honest truths about life.